During the last week of October we have fewer guests, since there is the possibility of cooler weather. But this year, it was the most beautiful week of the month. The sun was out with a high around 70, and the leave are turning - perfect conditions for hiking the 6 mile round trip to Lower Calf Creek Falls. The trees in the canyon are every assortment of colors at this time. Plenty of guests like to take this hike in the summer, and this is a great option if you want to sunbathe in the hot sand and cool off in chilly waters. It's a pretty melow hike without much elevation, and there are places to cool off in the creek along the way, but for some, the canyon may not look nearly as pretty through sweat dripping down your face in 98 degree weather! If you are tough enough to not mind the heat, be sure to carry more than one puny water bottle per person, and consider skipping breakfast to hike early. Then again, if you are staying at Canyons B&B, skipping our homemade breakfast is a tough choice! But, we'll give you a To-Go bag with hard-boiled eggs, fresh bread and fruit, and a few other things. 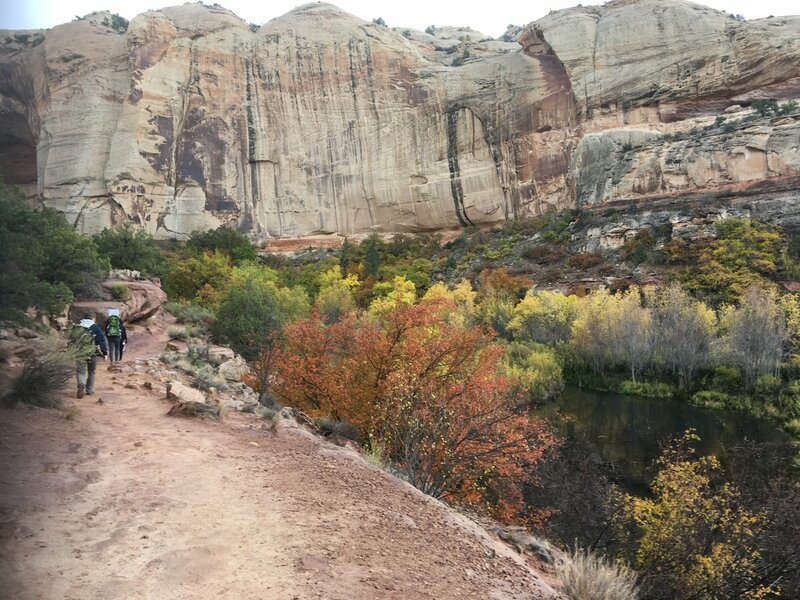 To find the trailhead at Lower Calf Creek Campground (from Escalante), drive east on Highway 12 for 19 miles, and look for the campground on your left, downhill by the creek. There is a parking area with camp hosts, bathrooms, hiking info, and a small day use fee. If you take a flyer, it will point out things to see along the way, like an indian grainary built high into the cliff or a large petroglyph panel that can be seen all the way across the canyon!